Evan Roth received a degree in architecture from University of Maryland and a MFA from Parsons The New School for Design. After completion of his MFA, Roth was awarded a Research and Development Fellowship at Eyebeam Art + Technology Center, the nation’s leading art center investigating the confluence of technology and art. During his residency at Eyebeam his research into graffiti, public space, social media, culture jamming, and open source technologies led to the co-creation of the Graffiti Research lab. 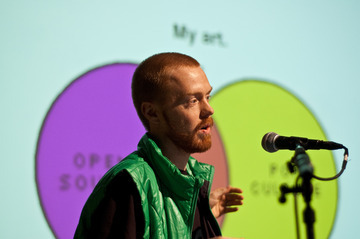 Roth has since also co-founded the Free Art and Technology Laboratory open source collective, FAT Lab. Early notable projects conducted as part of the Graffiti Research Lab included L.A.S.E.R. Tag, a projection based graffiti system that allows writers to project messages on public spaces, and LED Throwies, a strategy for graffiti using LEDs and magnets. Most recently Evan Roth and FAT Lab collaborators completed the EyeWriter, an apparatus that allowed paralyzed graffiti writer and activist, Tempt1, the ability to create text by tracking his eye movement. Multimedia projects such as White Glove Tracking used the open source platform Processing to reinterpret a performance of Michael Jackson by via motion-tracking data to manipulate the image. His MFA thesis Graffiti Analysis led to the video Typographic Illustration, which in turn led to a collaboration with hip-hop artist Jay-Z on an open source rap video. All of the projects are predominately looking at free speech and the right to express ones opinions. Roth’s work is in the permanent collection of the Museum of Modern Art in New York, and has exhibited widely in many notable museums in the Americas, Europe and Asia, including the Centre Pompidou (Paris), the Kunsthalle Wein (Vienna), the Tate Modern (London), and the Fondation Cartier Pour l’Art Contemporain (Paris). Roth has received numerous awards for his work, including the Golden Nica from Prix Ars Electronica, two Rhizome/The New Museum commissions, the Future Everything Award, and Brit Insurance Designs of the Year (presented by the Design Museum (London)). His work has been featured in online and in numerous publications including NPR, the New York Times, Time Magazine, CNN, The Guardian, ABC News, and Esquire. The McAndless Distinguished Professorship was established with the help of a generous bequest from the late M. Thelma McAndless, a Professor in the Department of English Language and Literature, College of Arts and Sciences. The McAndless Scholar is a nationally prominent figure in the arts and humanities. The purpose of the McAndless Scholar is to make extraordinary contributions to the vitality of the arts and humanities in the College of Arts and Sciences at Eastern Michigan University.